As the Toronto Marlies get set to open up the 2016 Calder Cup playoffs, we're going to dedicate this episode to the man who will be leading them in between the pipes: Garret Sparks. Before we get talking about his hockey ability and contract, you should all take a moment to appreciate this post-game interview after his first NHL start, where he recorded a shutout. 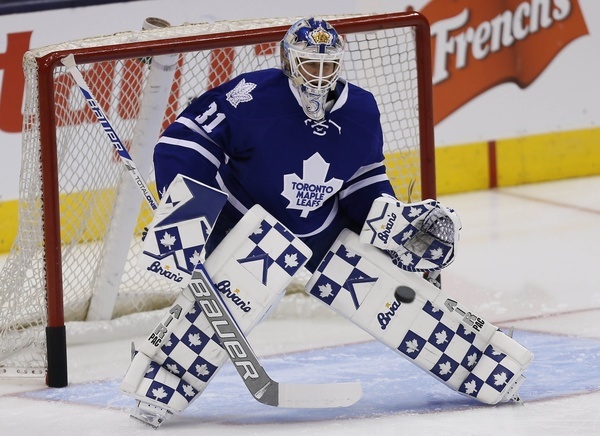 Sparks got a pretty good opportunity this season when the Leafs were without James Reimer. Jonathon Bernier was struggling, and Sparks took that opportunity to establish himself. But what did he establish himself as? An NHL starter? A quality backup? A good young kid who won't ever be a consistent NHLer? What Garret Sparks proved to be was not quite ready, yet. There were a lot of tools he was missing. Namely, shot recovery and puck handling. These are skills he will have to continue to work on. Simply not good enough for right now. The good news is there's a lot of promise there. His reaction time, flexibility, and size should allow him to develop the other skills in time. For now though, he doesn't quite belong in the NHL. Two of his closest comparables this season was Anders Lindback (yeah he really was that bad), who made $875k this season, and Keith Kinkaid, who made $725k. I think that's a good place to start. This seems pretty fair on both sides, and if he does get more NHL time his goaltending services will be very cheap. This contract allows Sparks to take AHL time at an NHL salary, which would be very attractive to him. Additionally, it makes any NHL time he gets come even cheaper. It's possible for the Leafs to like this option even better than the ideal one. Their pocketbooks can certainly handle it. This one says, if you make the NHL you get to be paid as much as Lindback, your closest comparable. But, if you don't, you make AHL money. Sparks might be confident enough to be pushing for something like this. It's still a deal the Leafs can certainly handle, but more than I'm sure they'd like to pay if he's in the NHL. I don't think there's really any situation where the Leafs don't bring back Sparks. It's entirely possible they bring in an NHL backup for Bernier, and let Sparks play in the AHL to start the season. They currently only have Bibeau (who has been less than stellar this year) and newcomer Kaskisuo, who could certainly benefit from some ECHL time. Either way, I look forward to Sparks' development, and hope he can become a solid goaltender for the Maple Leafs in the future. Be sure to check out last week's episode on Frank Corrado, and stay tuned for the next episode on Connor Carrick. Hey man, great stuff. I'm interested in touching base with you, but can't find your e-mail or Twitter bio anywhere on this page. Tweet at me at @Thomasdrance or send me an e-mail at thom.drance@gmail.com if you want to chat!